Hop in the car, drive the countryside roads, enjoy the fall colors and stop at one of these charming villages for a dive into the past and a taste of delicious seasonal products. 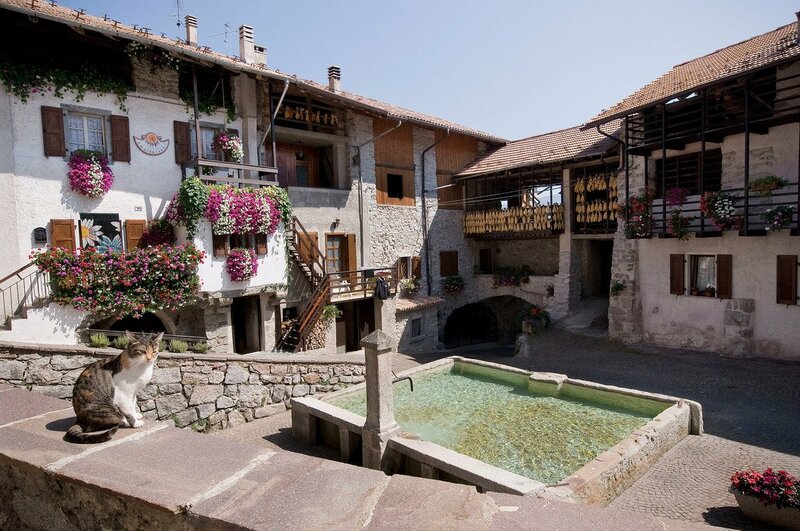 In the northern mountainous region of Trentino, Rango is part of Italy’s ‘Most Beautiful Villages’ network, having maintained its ancient fortified structure, with its old houses leaning against each other, connected by porticoes, hallways and internal courtyards. Half an hour from Lake Garda, Rango was originally located along the ‘imperial road’ that once led from Lake Garda to the Val di Sole valley. Don’t miss the visit to the parish church dating from the 15th century. An ancient white road (still used daily for rural access), which originates in the upper part of the village, takes visitors to the Passo del Durone (1.039 m s.l.m.) via an easy walk. Rango is especially famous for its Christmas market, but, head there in the fall and you’ll be able to enjoy the colors of the autumn season and lesser crowds to fully appreciate the slower pace of life that brings you back to Trentino’s ancient rural life. The name of Castelvetro, located among the hills south-east of Modena, is associated with that of Lambrusco Grasparossa, which is produced here. So what better time to visit than the fall when an annual festival dedicated to the fizzy red wine is held in the pretty historic center of the village (September). 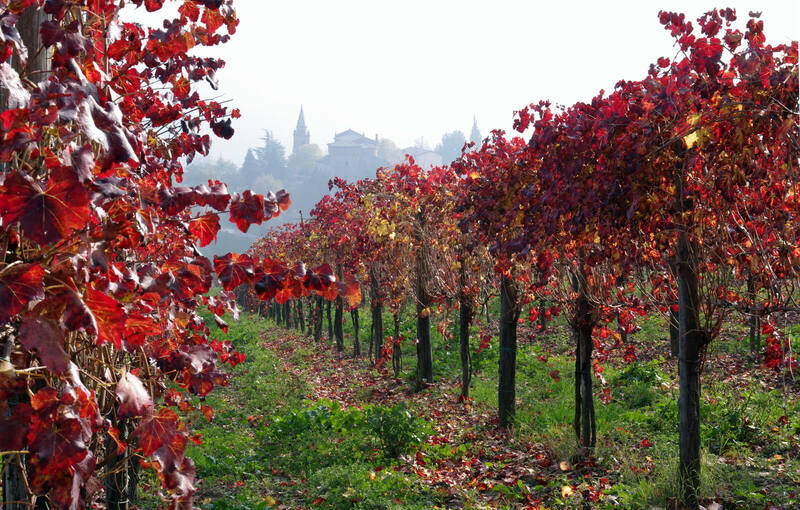 But even as we get into the heart of the autumn season, Castelvetro maintains its appeal as driving its countryside roads will allow you to admire the red-colored vineyards. Once surrounded by walls, the village itself has maintained some of its historic elements, including six medieval towers, three of which are even pictured on the village’s emblem. Piazza Roma is the heart of the village; here you can see the Clock Tower and the Prisons Tower. The walnut liqueur nocino is another famous production of the area, and, this being Emilia-Romagna, you’re never too far from a Parmigiano Reggiano, prosciutto or balsamic vinegar producer. Vitorchiano is located at the foot of the Cimini mountains, in the verdant Vezza valley. It’s set within a hilly landscape, rich in oak woods, ash, beech, elm and chestnut trees, and pristine creeks. Imagine walking in the area in the autumn season with its beautiful colors and the chance to even spot animals. 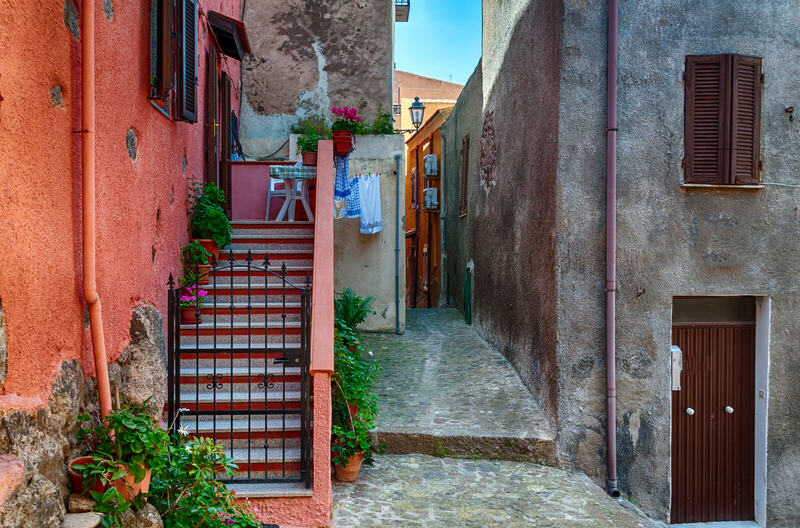 Perched on a cliff, Vitorchiano is in the province of Viterbo in the central region of Lazio. During the Middles Ages, it was an important fortified village, disputed between Rome and Viterbo. 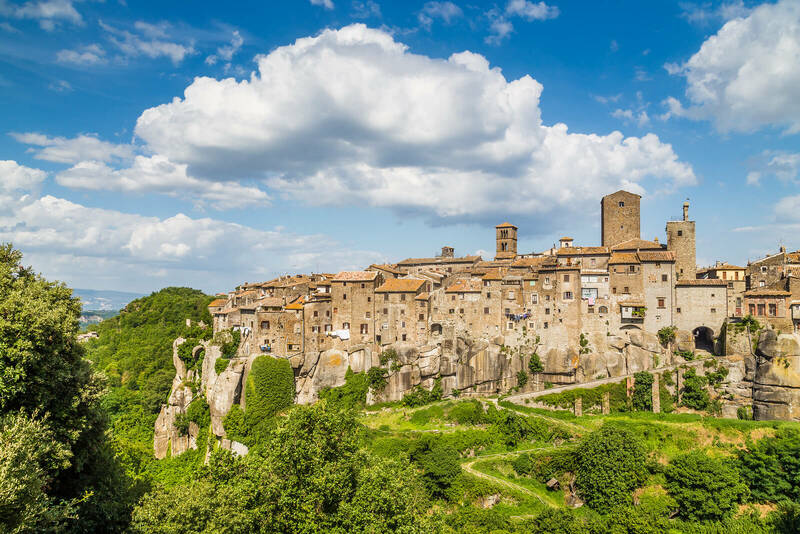 Vitorchiano has preserved well its medieval appearance, with its city walls (250 meters long), towers, access gates, houses overhanging the cliff, picturesque alleys and squares. Typical local products include chestnuts, hazelnuts, mushrooms, olive oil, wine, sheep and cow cheeses, and sausages, many of which are ideal to be tasted in the fall. In the southern region of Basilicata, Venosa, located in the territory known as Vulture, is rated among Italy’s most beautiful villages. The area has been inhabited since prehistoric times. The site of Notarchirico, located a few kilometers from town, is the oldest in Basilicata. Venosta was founded by the Romans in the year 291 BC to control the valley of the Ofanto and the Appian Way. In the Archeological Park are the monumental remains of the thermal baths. There are numerous churches and religious buildings to visit, including the Complex of Santissima Trinità, ‘national monument’ since 1897, and an Aragonese castle built in 1470. 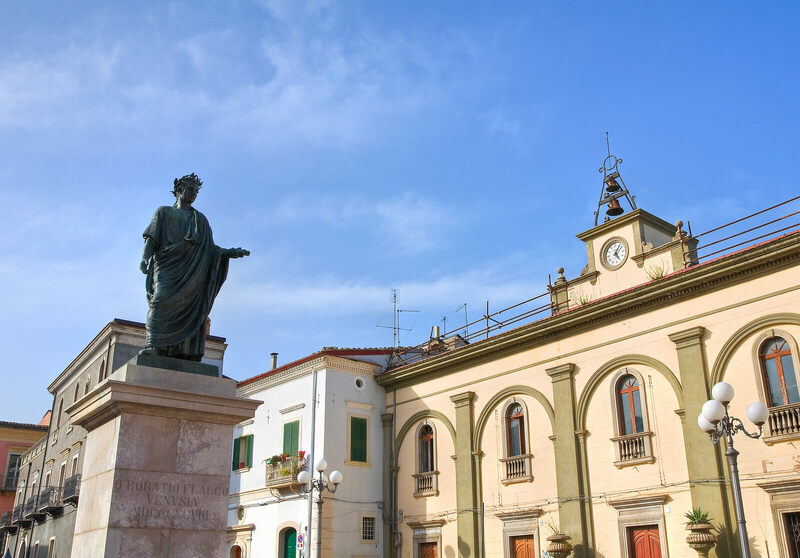 Venosa was the birthplace of Horace, the most important Roman lyric poet during the time of Augustus, author of the Odes and The Art of Poetry. During Roman times, Castelsardo was perhaps the mythical ‘Tibula’; in the Middle Ages, it had become an unassailable fortress, protected by massive walls and 17 towers. The nucleus of Castelsardo revolved around the Doria castle in the Middle Ages, which is now the seat of the Museo dell’Intreccio Mediterraneo, one the most visited museums on the island, dedicated to the tradition of basket-making. Located in north-western Sardinia, at the center of the Asinara Gulf, in an area of incredible beauty, Castelsardo is a delight to visit in the off-season, being Sardinia very crowded in summer. Its fortifications, including the bastions and steep stairs, remain intact. Among the sights not to miss are the Church of Santa Maria delle Grazie, the Benedictine monastery, the La Loggia palace, since the 12th century the seat of City Hall, and the Palazzo Eleonora d’Arborea.